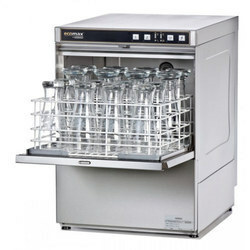 We are engaged in offering a wide range of Glass Washer. Our devices are acclaimed for their longer service life and less maintenance cost. Demands of our devices are increasing day by day owing to its compact size, robustness and sturdiness. These can be availed in various technical specifications and models. We have been counted amongst the most trusted names in this domain, engaged in providing Glass Washer. Adopting horizontal transmission, it washes the glass using soap water firstly, plain water secondly, and then dries the glass using hot air. This machine is of horizontal structure which is used to clean the flat glass with the thickness of 3~12 mm. Firstly the flat glass is placed on the transmission roller and then into the feeding part, cleaning part, drying part and lastly goes out. Wash Tank Operating Temperature: ..